I raided my family's herb garden the other day. Isn't that one of the great pleasures of living near family? Mooching off their stuff? When you've got such beautiful plants to work with, it doesn't take much to make your dinner taste good. So take advantage of these gorgeous herbs before getting sucked down the all-things-pumpkin vortex of fall. The morning before dinner, slice up your steaks into large chunks and toss in olive oil, balsamic vinegar, salt, pepper and a few bits of rosemary. Refrigerate and let it get good. 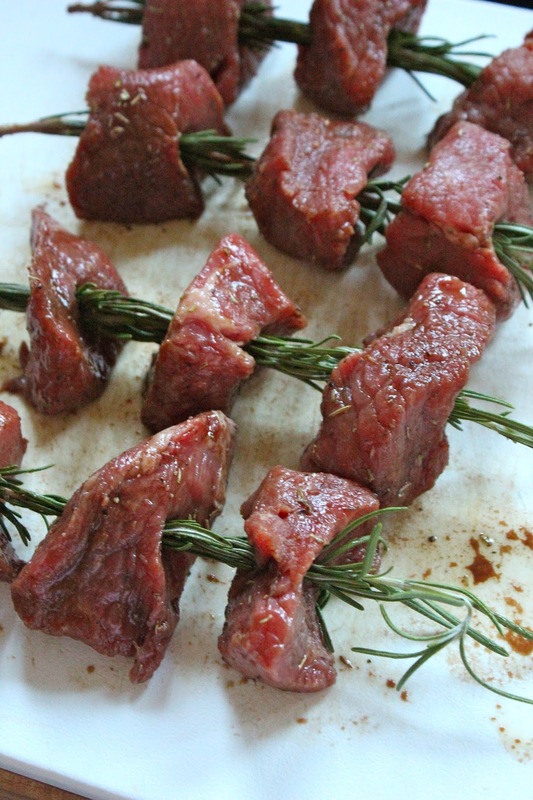 You'll poke a pilot hole through each steak bite with a skewer and then pass the rosemary stalk through, stem end first. Grill over high-direct heat for about 3-4 minutes per side, taking care not to break the stalk when turning. 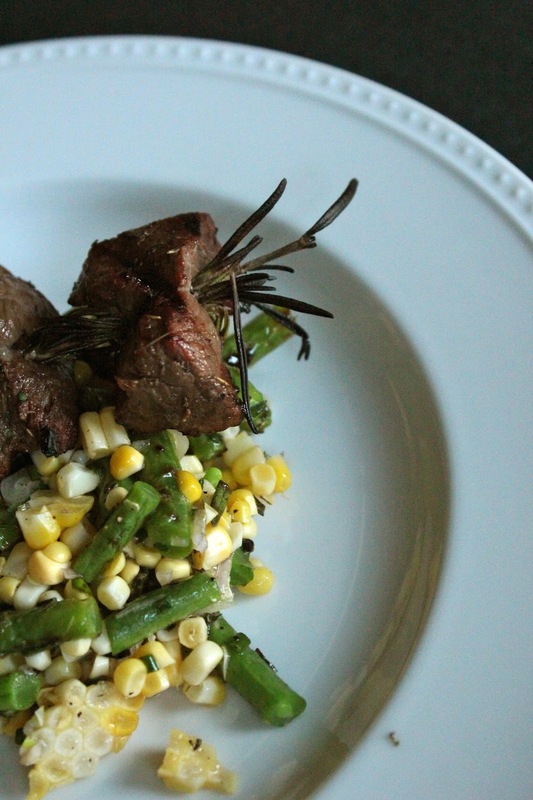 I ended up serving with a variation of my summer herb corn salad, this time adding one bunch of grilled green beans. Savor the summer while you still can. Whisk together olive oil, balsamic vinegar, salt and pepper. Roughly chop 2 stalks rosemary and stir into marinade, along with steak chunks. Refrigerate, covered, for a few hours. Remove steak from fridge about 30 minutes before cooking. 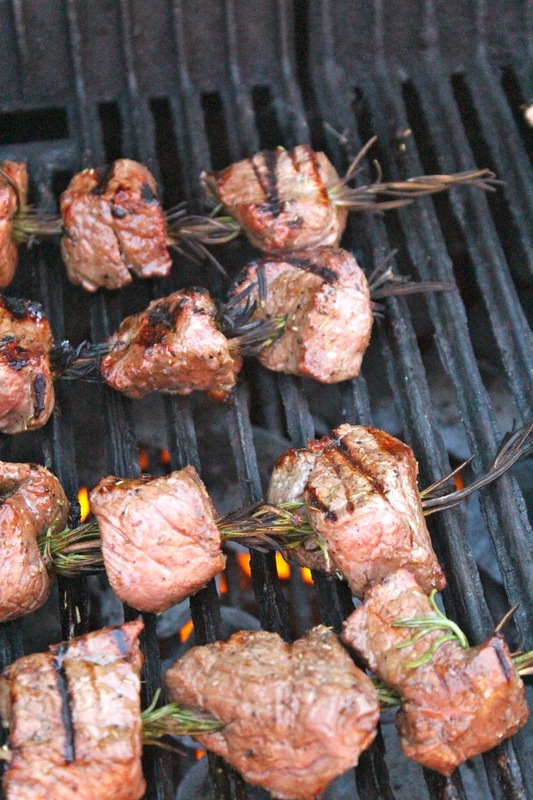 Use a skewer to poke pilot holes through the middle of each steak bite, and then load 3 onto each stalk of rosemary. Grill over direct-high heat for 3-4 minutes per side, taking care not to break the rosemary when turning. Remove from grill when internal temperature of the steak is 120 degrees. Allow to rest for at least 5 minutes before serving. Enjoy! Love this idea. So much more flavor than traditional kabobs. Must try this weekend! Oh wow, this looks delicious! 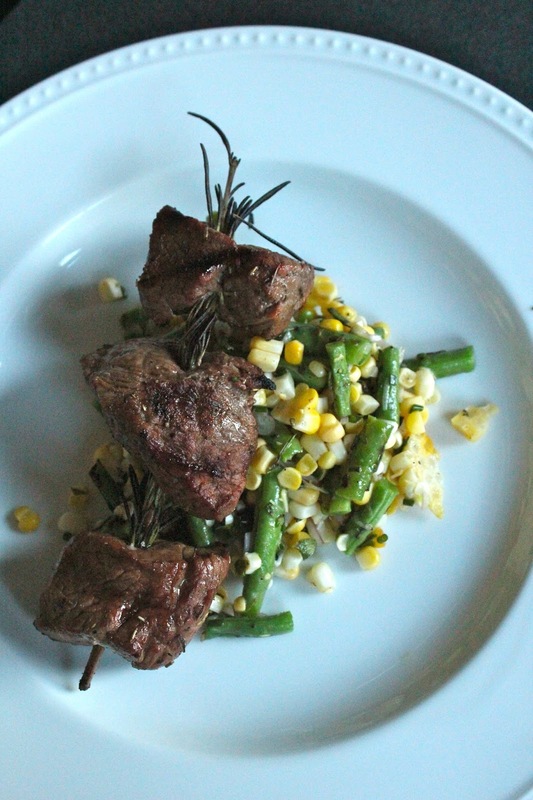 I am a huge fan of rosemary and could see this working equally well with lamb. Yum.